Time for a new update in the form of a Windows binary from the latest ccminer 1.7-dev (source), so that you can try it out if you are interested. Tpruvot has been rewriting a lot of things in his fork for the upcoming official 1.7 release, so there are quite a lot of changes as well as new features implemented. 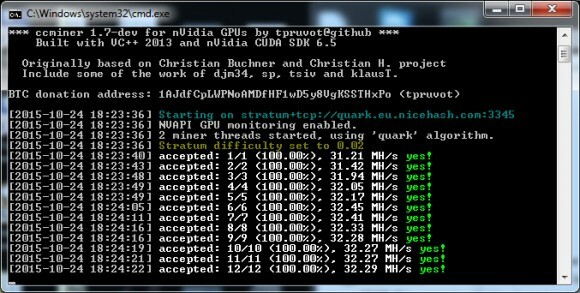 The latest updates can be useful to people that have older Compute GPUs, especially with Compute 2.0 (SM 2.1) where all X-based algorithms along with some others should now work properly, along with some fixes for newer Compute cards and others. You should use this release just for trying it out and if you want more stability and reliability you should probably stick to the previous 1.6.6 release. This Windows binary is compiled with VS2013 and CUDA 6.5 and supports Compute 2.1, 3.0, 5.0 and 5.2 GPUs, but do have in mind that not all of the supported algorithms may work on older Compute 2.1/3.0 GPUs, still if you have an older Nvidia-based video card this is the ccminer fork you will need. We have not compiled a Windows binary from the Git source of tpruvot’s ccminer fork for quite some time and he has been quite actively working on version 1.7, though it is still not ready for an official release. So we have decided it is time to compile a Windows binary from the latest ccminer 1.7-dev (source), so that you can try it out if you are interested. Tpruvot has been rewriting a lot of things in his fork for the upcoming official 1.7 release, so there are quite a lot of changes as well as new features implemented. So you can use this release just for trying it out and if you want more stability and reliability you should probably stick to the previous 1.6.6 release. 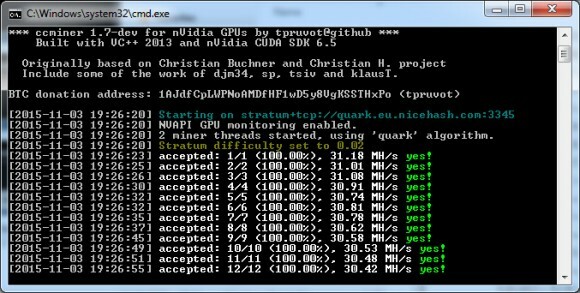 This Windows binary is compiled with VS2013 and CUDA 6.5 and supports Compute 2.1, 3.0, 5.0 and 5.2 GPUs, but do have in mind that not all of the supported algorithms may work on older Compute 2.1/3.0 GPUs, but if you have an older Nvidia-based video card this is the ccminer fork you will need.